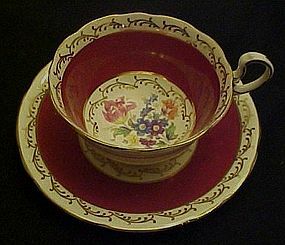 Gorgeous bone china cup and saucer set made by Aynsley in England. Maroon or burgundy wide band with floral center inside cup. Lots of gold scroll bordering center pattern and edges. Dainty gold trim embellished handle. No chips or cracks. A few small scratched areas on maroon border of the saucer. Feel free to ask to see a photo. It's not a problem, but was worth mentioning. 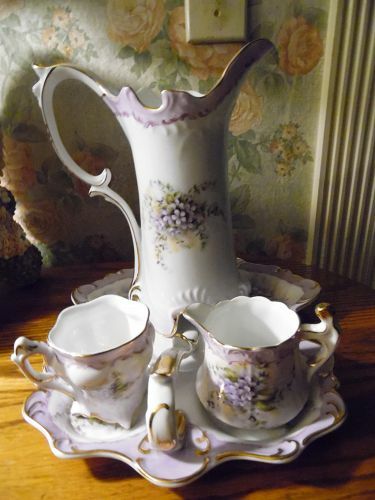 A lovely vintage set. 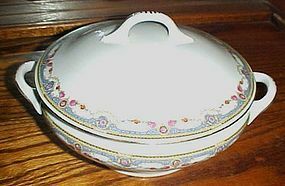 Blue Goose pattern by Baker, Hart & Stuart. 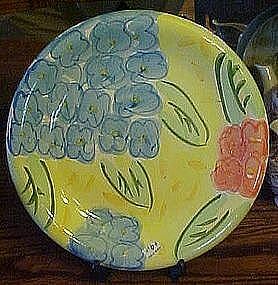 This nice dinner plate measures 10 5/8" in diameter. 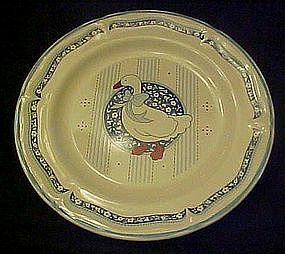 White goose with blue ribbon centered in a calico circle with orange feet.Oven to table and microwave safe. I have 3 available and all are like new with no damages or marks. Price is per plate. 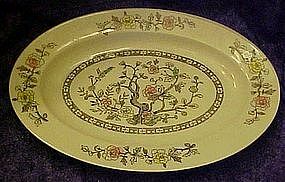 B Bloch & Co Eichwald Czecholslovakia pattern CZE4 oval platter 14"
Vintage 14" oval platter by Bloch & Co. / Eichwald, Bohemia. Pattern CZE4. 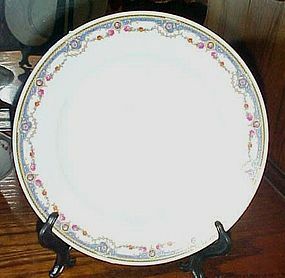 Excellent condition, Blue and yellow rim design with roses swags and shiny gold edge trim. Marked with the crown logo E Made in Czechoslovakia. I will be listing other pieces in this pattern. All pieces are pristine and look to be like new, and possibly were never used. I combine shipping to save you money. Please include your zip when inquiring so I may calculate your shipping. Beatrix Pottery Benjamin Bunny, mug or (Winter Beaker) made by Royal Doulton. It measures 3 1/2 inches tall and it is in perfect condition with no chips, nicks, cracks, or stains, dated 1986. 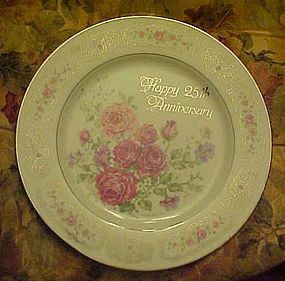 Gorgeous and lavish pink roses decoration, with silver trims, on this 25th Aniversary plate by Betty Whiteaker and Enesco. Measures 10 3/8" in diameter and is in PRISTINE condition. Would make the lovliest gift ever for the couple's 25th silver wedding anniversary.Signed by the artist. 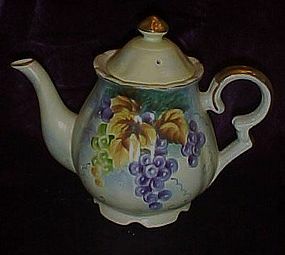 An exquisite teapot in Leftons hand painted Festival pattern. beautiful hand painted grapes and leaves with gold accents. Well marked, and in perfect condition. These are VERY hard to find in this pattern. No chips, cracks, repairs, or wear on the gold. Measures 7 1/4" tall. There is a leaf on the other side of the lid, but I had the lid turned in the photo to show the steam hole. 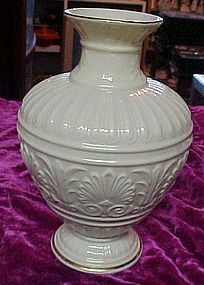 A gorgeous ivory color porcelain vase with gold trim by Lenox china. This is from their Athenian collection. Measures 8.25 inches tall and is pristine. Pretty shell and fleur di lis pattern type. Marked with the gold lenox stamp USA. You will not be disapointed. Would make a lovely gift too. Beautiful Florentine bud vase by Lenox fine china. Measures 10 3/4" tall and is in pristine condition. Creamy ivory color. The is the most beautiful hand painted china set. Consists of a handled, sectioned tray, pitcher, creamer and cup. 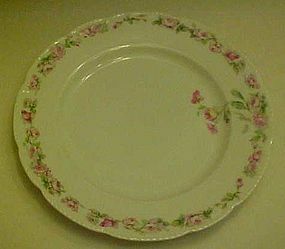 Marked Limoges China. CB, and one piece marked made in china. Beautiful gold embellishments and oodles of hand painted violets. Elegant handle and so feminine. Pitcher measures 8 3/4" to the tallest point. All pieces are pristine and would make a stunning gift. 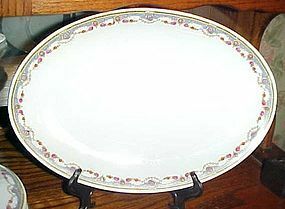 A perfect service for one special lady.Even though marked Limoges, it appears new, but is stunning none the less. Beleek style cup and saucer ?? 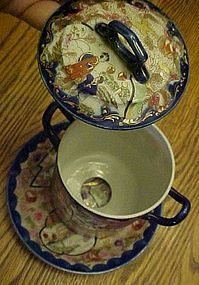 Very old, could be beleek, cup and saucer set. Cup is paper thin with swirls in the china pattern. 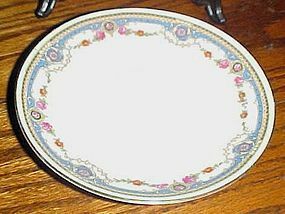 Decorated with a rim of browm flowers with blue dots in relief. 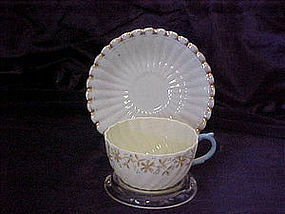 The saucer has the identical swirl in the china pattern but is plain and edged in gold. The saucer has more bulk to it than the cup. Only mark, is on the cup, a number 57 in gold. No chips or damages to set.